Look at the tiles as if you are looking in a mirror. Imagine a line running through your shoulders connecting the left and right face. Thats the X-axis. It’s blue. Imagine a line running from in front of your heart to behind your back. It’s the Z-axis. It’s red. A plane can be defined by 2 axes. 3 planes naturally separate the body into halves. Wall plane: Splits the body into front half and back half. An arm or prop rotating around the front back axis will be moving in wall plane (green: combines up/down (yellow) and left/right (blue). Wall plane is one of two vertical planes. Wheel plane: Splits the body into left half and right half. An arm or prop rotating around the left/right axis will be moving in wheel plane (orange: combines up/down axis (yellow) and front/back axis (red). Wheel plane is one of two vertical planes. Floor plane: Splits the body in top half and bottom half. 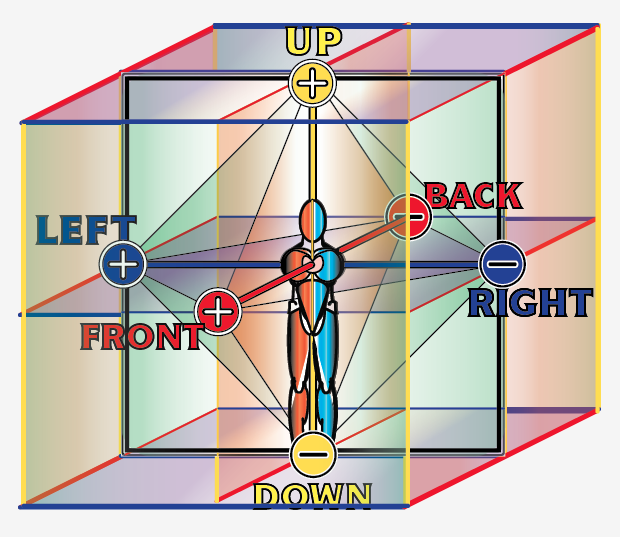 An arm or prop rotating around the up/down axis will be moving in floor plane (purple: combines front/back axis (red) and left/right axis (blue). Floor plane is the only horizontal plane (sometimes called ceiling plane or horizontal plane).